To ITILity - and Beyond! The ITIL service catalog is a useful tool as far as it goes, but often that is not far enough. 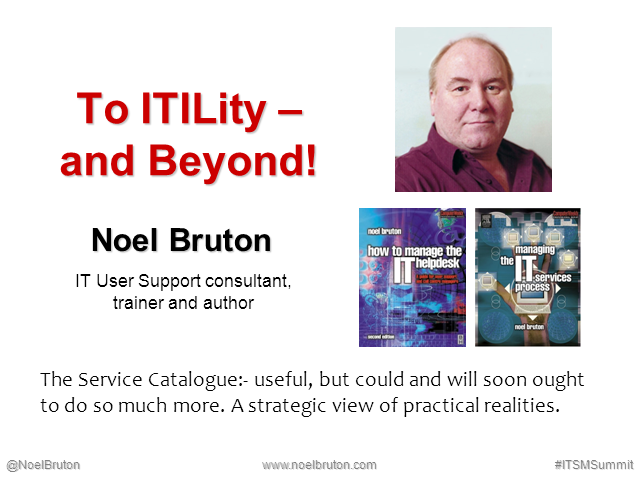 Long-established IT support consultant and author Noel Bruton will argue that, taken from appropriate principles, the design of the service catalog can go much further. With the right strategy at the outset, the service catalog process can and should inform such crucial decisions as staffing structure and numbers, service ownership and authorities, skillsets and potential points of failure. The service catalog should be more than just a list of outputs - it should be at the heart of a manufacturing plan for the IT services factory floor, with all that necessarily implies. But there is another emerging pressure that will test the traditional service catalogue to its antiquated roots. This is from the ubiquitous and accelerating rise of users' own tech in the workplace and the blurring of the very definition of "workplace" itself. Bruton will argue why and how these developments give even more impetus to see the service catalogue more as the first draft of a factory production plan for both present and future challenges. He will describe in outline how such an approach may look. Title: To ITILity - and Beyond!